Black Hornet, a small drone, flies during the Marine Air-Ground Task Force Integrated Experiment (MIX-16), at the Marine Corps Air Ground Combat Center in Twentynine Palms, California, on July 29, 2016. The Black Hornet has already been used in Afghanistan by the British military, and the U.K. Ministry of Defence was sufficiently impressed to make it an ongoing part of the country's military kit. It's made by Norway's Prox Dynamics, and the Norwegian Special Forces have ordered a version with night-flying capability. The drone is also used by a handful of other countries. U.S. Marine Lance Cpl. 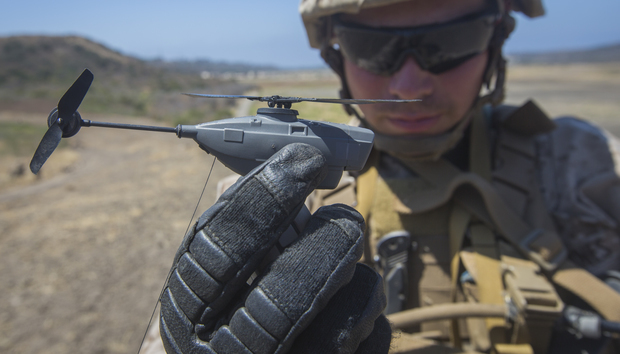 Cesar Salinas, an infantry Marine with Kilo Company, 3rd Battalion 5th Marine Regiment, catches the PD-100 Black Hornet after an exercise on Camp Pendleton, California, on July 9, 2016.